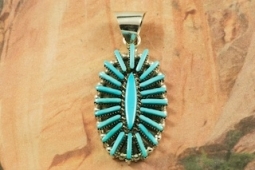 Genuine Sleeping Beauty Turquoise set in Sterling Silver Pendant. Beautiful Petit Point Design. The Sleeping Beauty Turquoise Mine is located in Gila County, Arizona. Free 18" Sterling Silver Chain with Purchase of Pendant. Created by Zuni Artist Carla Laconsello. Signed by the artist. The Zuni Pueblo is located in New Mexico, Land of Enchantment.